Wooden boats and Southport…it’s like the Cape Fear River Pilots guiding a freighter up river, commercial fisherman returning to the Old Yacht Basin with their Brunswick Catch, the Old Smithfield Burying Grounds, hosting NC State’s official 4th of July celebration, the Gentleman Pirate Stede Bonnet careening the Revenge through the Cape Fear inlet, or all the local history on display in Southport’s NC Maritime Museum and Visitor’s Center. All are an integral part of Southport’s heritage and are celebrated each year at the Southport Wooden Boat Show. The 8th Annual Southport Wooden Boat Show (SWBS) was a huge success with an estimated attendance of over 10,000 people and new exhibits! A new annual President’s Award was added in 2017 to recognize the special support of local volunteers or business people. The 2017 award was given to Ricky & Debbie Evans who’ve unselfishly supported the SWBS since its inception. Working with the City of Southport and the impacted neighbors, the SWBS is proud to say we secured for the day of the event a Handicap Parking area to assist those with disabilities to have easy access adjacent to the main downtown entry point on Moore Street, with a golf cart shuttle stop right there. 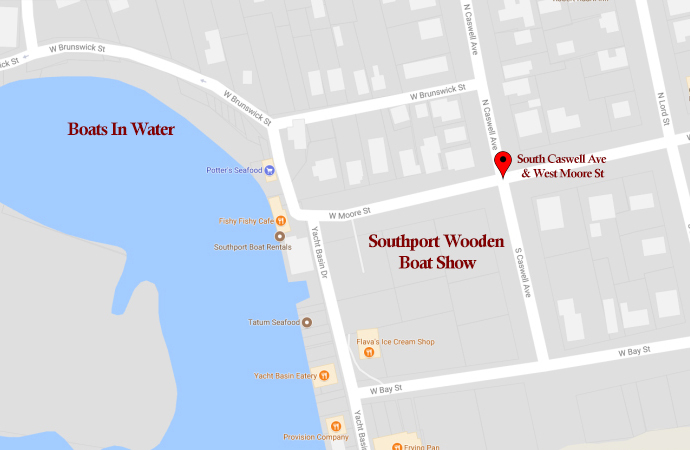 The 9th Annual Southport Wooden Boat Show will be held on Saturday, September 29, 2018, at the historic Old Yacht Basin in Southport, from 10 a.m. until 4:00 p.m. The In-Water event will end at 3:30 p.m. for the Awards Ceremony at 4:00 p.m. in front of the entertainment tent. 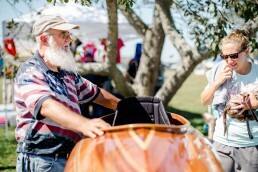 Our tradition continues with boats on display on land and In-Water with visitors being able to meet and talk with wooden boat makers and owners, and to vote for their favorite boat entrant for the People’s Choice Award. Additionally a team of judges will also award six other prizes. 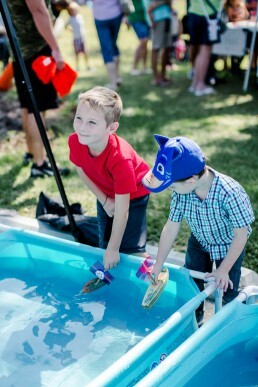 Children Activities will return to this year’s show under the tutelage of the NC Maritime Museum of Southport’s Nauti-Kids program. 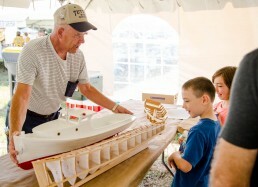 The little sailors will be able to build (with or without help) their own boats and test their sea-worthiness, to learn rope making, learn to sail in a static display and learn from exhibits by the North Carolina Aquarium and The Ft Fisher Underwater Archeology Branch as part of the day’s activities. More boats, both in and out of the water, and more nautical/maritime vendors are expected at this year’s show, which has been growing every year. Nautical & maritime demonstrations are planned along the waterfront, and the model boat exhibit will return. A new collectors’ quality poster has been designed, as well as the special edition T-shirt for this year’s show. Both will be available at the show from the Ship’s Store tent. Once again, there will be many exciting items to be raffled. Read about our expanded food event, A Taste of Cape Fear, featuring a Seafood Chowder and Shrimp & Grits made by the award winning Frying Pan Restaurant Chef. This is accomplished through the SWBS Event Committee (below) and an exceptional volunteer workforce. The Southport Wooden Boat Show’s purpose is to promote interest in and disseminate knowledge of the craft and art of wooden boat construction, to support efforts to preserve wooden boat construction and skills and to celebrate the region’s maritime and boatbuilding history. This is accomplished through the SWBS Event Committee and an exceptional volunteer workforce. The Southport Wooden Boat Show is a tax exempt 501(c)(3) organization. No goods or services are rendered for contributions, and they are tax deductible to the extent allowed by law.